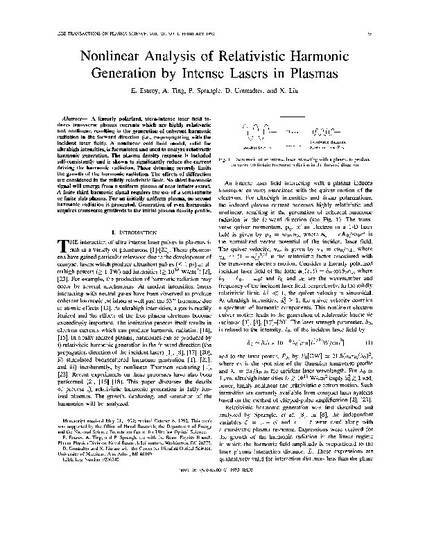 IEEE Transactions on Plasma Science. 21, 95 (1993). Copyright 1993. Permission to use. A linearly polarized, ultra-intense laser field induces transverse plasma currents which are highly relativistic and nonlinear, resulting in the generation of coherent harmonic radiation in the forward direction (i.e., copropagating with the incident laser field). A nonlinear cold fluid model, valid for ultrahigh intensities, is formulated and used to analyze relativistic harmonic generation. The plasma density response is included self-consistently and is shown to significantly reduce the current driving the harmonic radiation. Phase detuning severely limits the growth of the harmonic radiation. The effects of diffraction are considered in the mildly relativistic limit. No third-harmonic signal emerges from a uniform plasma of near-infinite extent. A finite third-harmonic signal requires the use of a semi-infinite or finite slab plasma. For an initially uniform plasma, no second-harmonic radiation is generated. Generation of even harmonics requires transverse gradients in the initial plasma density profile.